Brandan represents Bodybuilding.com with class and muscle mass. He's the definition of a hard-working Midwesterner. His accomplishments are stacking up, but he's far from satisfied! I started working out as a freshman in high school. A friend of mine down the street had a little weight set and was already into working out. He persisted that I work out with him and when I finally did I was nowhere near his level. Of course, back at school the next day he had to tell everyone I was "weak" and I got teased the rest of the week. I decided that I wasn't going to let that happen anymore and wanted to better myself, so I started working out in the high school gym, and eventually got my first gym membership. When I was younger, all I wanted to do was lift as heavy as I could and be strong. I didn't care about balance or longevity, and due to that suffered many injuries. Now that I am older, I try to balance my workouts and lift far lighter, but with the same intensity as I did when I was younger. I believe you have to listen to your body, push it when you can, and hold back when it gives you signs of wear and tear. Sure I train tired, and sore just like anyone else, but when I'm injured and know that I am, I take some time off to recoup and take care of myself. In the past I would have tried to push through and would make things worse. I'm usually lifting heavier at the beginning of show prep and taper the weight down and take the reps up as I get closer. On my sixth day, I will pick 2-3 body parts I think are lagging and do a touch up. I may do a circuit, or I may pick 2-3 exercises for each group. I really focus on the muscle and take time to make sure I've worked it effectively. These days I normally lift very light, strict form, high reps. Without nutrition I wouldn't be where I am at today. It's the foundation that everything else is laid upon. Depending how I want to look, or if I have a contest coming up, it's through nutrition that I make those changes. I eat about every 2 1/2-3 hours. I also have a shake and a banana after my training session. In my on-season diet, I taper my carbs down as I go into the show. I have carb cycled in the past, but for my next contest I will do a gradual deplete. I wouldn't be where I am at today without supplementing my diet. There are a lot of products on the market, and some great ones, but for myself I recommend Force Factor supplements. Their entire line is GREAT! They are also priced right and offer a lot of knowledge/science that backs up what they sell. If I were to recommend any other company I would recommend looking at and reading the reviews on Bodybuilding.com and go through them for your nutritional needs. You can also purchase Force Factor through Bodybuidling.com, so you get the best of both worlds! I have loved sports my entire life and always had aspirations of being big and strong. I was a naturally-gifted athlete and participated in baseball, basketball, and football. I was that guy who even went all out in gym class. When it came to weightlifting, I just wasn't good at it, so starting my freshman year of high school I really put in the time and effort to make myself better. I loved the sport of bodybuilding, and followed the sport through high school. All through my 20s I did the same and always talked about doing a show, but didn't really know where to begin. My friend Trevor Larsen decided to do his first show and tried talking me into doing one with him. I talked to my friend Ned Sacipovic and asked for his help. Ned has more experience in the sport than anyone I know, so if anyone could help me it was him. He said he could get me ready, so I got started. I did my first bodybuilding show at the age of 30. I competed in light heavy and eventually made it up to the heavyweight class. Shortly thereafter, I moved to the physique division where I am at now. Growing up I looked up to Superman. That may sound odd to some people, but due to the way I grew up I needed that "hero" in my life. I had a very turbulent childhood and went through a lot of things kids should never have to. Nobody messed with Superman, and when they did ... they lost. Strength meant that he couldn't be hurt, and I was hurt a lot and wanted to be like him so I wouldn't be anymore. Also, early on in my childhood Hulk Hogan was a hero of mine. He had his 24-inch pythons and always came into the ring flexing like a bodybuilder. I wanted to be like that. I wanted to "Say my prayers and take my vitamins" like Hulk Hogan told me too so I could be just like him. In the present, my friend Ned Sacipovic is one of my top motivation factors, along with my friends, IFBB pro Trevor Larsen and Tim Johnson. The three of them all have, in one way or another, brought out the best in me, motivated me to be better, and carry on even when I've doubted myself and thought I couldn't. As a whole, I owe a lot to so many great and supportive friends and family and wouldn't be here today without all of them and their constant support. I look at and read a lot of positive quotes and literature, study people with drive and ambition, and try and better myself through their example. I also feed off of the people who say I can't do something. I look to my family and friends for strength; they are always there for me and a great source of motivation. I admire anyone who has self-confidence; someone who goes against what others tell them they have to do to do what they feel is right. You can be inspired by athletes who are total beginners to the most advanced. You just have to open your eyes and be open to it. I have recently started working with Kim Oddo. With his help, I'm hoping to bring in a new and improved physique from past competitions. I'm looking at two national shows right now where I hope to get my IFBB pro card. I will be competing in the Muscle & Fitness challenge at this year's Olympia expo, as well. I won the Muscle & Fitness online portion of the contest for the second year in a row, and am going back to hopefully better my last year's placing of fourth. I am also working with many competitors as a coach and trainer helping them with their show prep, and am having a great time doing that! I couldn't be more proud of my clients. I don't think you can name just one. You need to first of all be OK with yourself at whatever you are involved in or what level you are at in anything you are doing (workout routine, diet, etc.). When you are ok with yourself and love yourself, you will make more of a commitment to the betterment of you. You also won't get discouraged when things don't go exactly how you want them to. You will have the strength to carry on and continue to try to achieve the results you are striving for. Everything takes time; it took time to put on the weight so it will take time to take it off. Set some realistic goals and then set a big goal at the end. Enjoy each incremental goal that you have achieved on the way to your big goal and celebrate those victories on the way to a better you. If you are having a hard time with the plan you're on, take a step back and reevaluate what you are doing and make sure the plan is right for you. Make sure your diet and workout routine fits in accordance with your goals, diet being the most important. If you're not eating for results, you will never have the success you want. Surround yourself with positive people and people who help you along the way. Negative people will just bring you down and make it that much harder for you to achieve your goals. The people that bring you down are afraid of change, and feel that you're positive attitude and hard work somehow makes them need to make those changes too, which scares people, so they will become your worst critics. Rise above that and work on you; you are the best investment you can make. 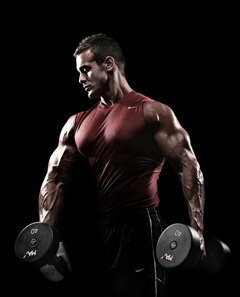 Use the resources you have such as Bodybuilding.com and educate yourself. Make sure you're doing a routine that is right for you and you have a good diet plan in place, too. Nutrition is 80 percent of the equation. If that doesn't work, consider hiring a trainer. Don't try to be just like someone else - that's a recipe for failure. It's OK to look up to, learn from, and be inspired by others, but don't put yourself below them and assume they are better than you. Be you! Blaze your own trail! You can accomplish anything you want with a strong mind, strong goals, and hard work! So if you want something, go get it. Arnold Schwarzenegger is my all-time favorite bodybuilder. His physique was out of this world. Arnold, in my opinion, is the father of modern bodybuilding, and is an example of what I try to follow. Arnold truly is the American dream; he came to America barely even able to speak english. He succeeded in everything that he went after; bodybuilding, acting, real estate, Governor, etc. I think that Arnold had a great understanding of what the human body is capable of and knew that with a strong mind he could achieve and has achieved everything he set his sights on. He was able to be the best in an era where the nutrition, supplementation, and overall knowledge of the sport was in its infancy. Even today you don't see people walking around looking like he did way back then. I first started a BodySpace account about six years ago. I reached out initially to many of the members with questions and was treated with respect and everyone was helpful. Over time, I grew as an athlete and used the site as a tool for knowledge, tips, and motivation. I've read hundreds of articles posted on the site and can say without a doubt that I am a better trainer, competitor, and even a better person because of Bodybuilding.com. I have been humbled by many people's stories, setbacks, strength, perseverance, and triumphs and have learned a lot about people as a whole and myself following others on the site. Now that I'm a Team Bodybuilding.com athlete, I truly feel like I am a part of a great group of people that stand behind me in all that I choose to go after. I'm constantly encouraged and also given the help and tools needed to help make a difference in myself and others. Thank you everyone at Bodybuidling.com for all you have done for me, I truly appreciate all of you!